Communications service providers (CSPs) are evolving their network infrastructure, systems and operations to software defined networking (SDN), enabling the launch of new, virtualized offerings. These offerings, such as SD-WAN, require agile, on-demand connectivity with assured service quality that is orchestrated across different domains, also known as Lifecycle Service Orchestration (LSO). With LSO, carriers replace manual, swivel-chair heavy, ordering processes with automation that accelerates service activation when buying and selling access and broadband services. 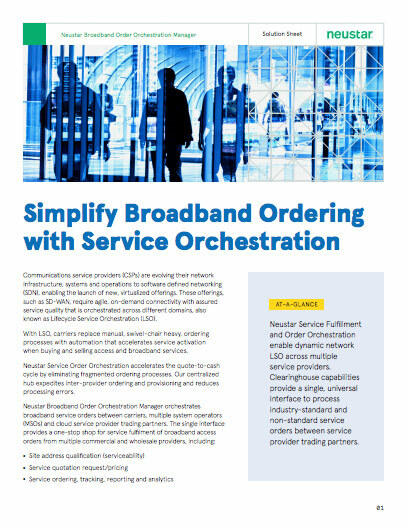 Neustar Service Order Orchestration accelerates the quote-to-cash cycle by eliminating fragmented ordering processes. Our centralized hub expedites inter-provider ordering and provisioning and reduces processing errors. Automation to qualify, quote, order and provision broadband services from multiple carriers and MSOs. Our single interconnection to multiple providers eliminates the need for custom interfaces to individual trading partners. Neustar provides greater transparency into the process so that your customers are kept up to date of the progress of their order. SD-WAN services from CSPs, cloud service providers and new managed service provider (MSP) entrants are driving demand for commercial broadband services. A primary use case occurs when the end customer for SD-WAN services has branch office locations that need to be serviced, but lie outside of the service provider’s footprint. In this case, broadband access from a local ISP or wholesale provider is often the best, most cost-effective connectivity solution to quickly on-board the service location.